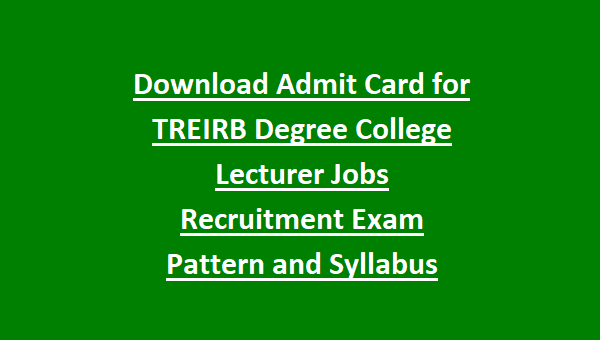 Download Admit Card for TREIRB Degree College Lecturer Jobs Recruitment Exam Pattern and Syllabus, Telangana TREIRB Degree College Lecturer Jobs Exam Download Admit Card, Exam Syllabus Now, Documents required attending the Exam of TRIERB Degree College Lecturer Jobs, Important Dates for TREIRB Degree College Lecturer Admit Card, Exam Dates, How to Download Hall Ticket /Admit Card for TREIRB Degree College Lecturer Jobs Recruitment Exam 2018? mail to download the admit card from official website of www.treirb.telangana.gov.in. Admit card for these Degree College Lecturer jobs of Telangana will be available to download 10 days before the exam date. Online computer based exam will be conducted in the month of September/October-2018. Admit card link will be activated at official website of TREIRB @www.TREIRB.telangana.gov.in. We are also providing the exam syllabus in PDF format for this Telangana Govt Degree College Lecturer Jobs. Candidates must have shown a valid ID & Address proof to attend the exam along with Admit Card for TREIRB Degree College Lecturer Recruitment Exam 2018. For both the papers candidates must have shown the admit card or hall ticket for both the papers. If you failed to show the admit card for second paper for TREIRB Degree College Lecturer Jobs you may not be allowed to sit for examination. 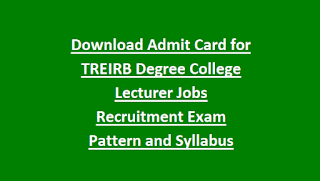 How to download admit card/Hall ticket for TREIRB Degree College Lecturer Jobs, exam pattern and syllabus for TREIRB Degree College Lecturer Jobs are given below. There are total 465 vacancies in Degree College lecturer recruitment. For 395 posts only women candidates are allowed to apply and for other 70 posts both female and male candidates can apply. How to Download Hall Ticket /Admit Card for TREIRB Degree College Lecturer Jobs Recruitment Exam 2018? Candidates can download the admit card from the official website only. At first open the TREIRB official website. Click on the link of "Download Admit Card/Hall Ticket for TREIRB Degree College Lecturer-2018 CBT Exam". A new page will be open enter your registration id and password. After clicking on submit button There you can see your admit card for Degree College Lecturer (Written Test). Verify your name, photo, exam center, address and other details and then click on print button. Take two or three copies of Hall ticket which is will useful in further stages. Please check your admit card for exam date, time and venue. Download Exam Pattern and Syllabus here for Degree College Lecture jobs in Telangana REIS.